The ProDry cleaning process was developed on the idea that there had to be a healthier, more effective way to clean carpets without the damaging environmental impact than traditional steam cleaning entails. We solved this problem by choosing to go the route of Carpet Encapsulation with the use of our main product ENCAP-Extra — a green-certified, safe and non-toxic cleaning solution to deliver an unmatched carpet cleaning experience. This process relies on the deep-cleaning of our carpet cleaning machines, the magic of encapsulation and the use of 80% less water than typical steam cleaning, which greatly reduces dry times and the risk of mold and mildew that excess water can cause. The result is a deeper, longer lasting, faster drying clean and the peace of mind of having a healthier home for you and your family. If your carpet has seen better days, call us today to schedule a deep carpet cleaning. 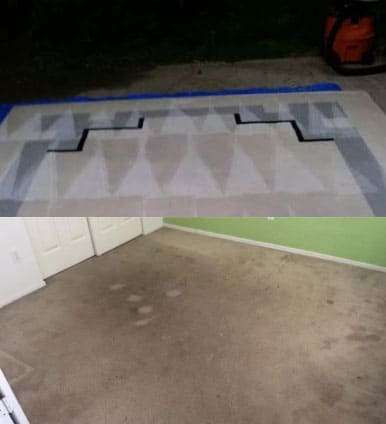 We have the tools and experience necessary to get your carpet back to looking its best, feeling great under your bare feet. 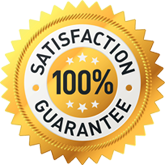 We offer a variety of packages that include different services so you are sure to get exactly what you are looking for with your cleaning. At ProDry Floor Care, we use a low-moisture cleaning technique that is sure to leave your carpet looking brand new. It also means your carpet will be completely dry after one or two hours so you can get back to your regular day with a carper that looks fantastic. Here are four tips to be ready for your carpet cleaning session with us. Be Prepared – Make sure any furniture is moved away from areas you want cleaned. Bigger items like beds and dressers we cannot help with and need to be moved ahead of time. Open a Space for Us – We will be bringing a lot of equipment in, so allowing us to use the closest parking spot to your door will benefit us greatly. Be Careful – We’ll try and get the job done as quickly as possible, but while we are there, please use caution around our technicians and equipment. Don’t Be Shy – We hope you will share your every concern with us to assure the job is always done to your exact specifications. You can also help prepare your home by trying to regulate the temperature to 70 degrees, if possible. Ceiling fans or area fans can also be turned on to help circulate the air in your home. Most importantly, just be ready to be wowed at how great your carpet will look after ProDry Floor Care is done with it. When you use less water, carpets simply dry faster. Instead of using gallons of water like typical steam cleaning, ProDry uses only a fraction of the water. This low-moisture process combined with our natural encapsulating cleaning solution penetrate deep into your carpets fibers and not only leaves carpets cleaner, but reduces dry times to a couple hours rather than a couple of days. So you and your family can get back to enjoying life in your cleaner, healthier home more quickly. ProDry’s goal is to help you spend less time worrying about whether your carpets and furniture are clean and safe and more time enjoying your family in a clean healthy home. 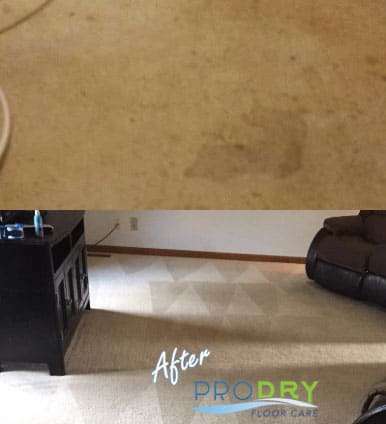 ProDry uses a specially designed, green-certified cleaning solution that employs the magic of encapsulation to penetrate deep into your carpet, breaking up dirt and grime and lifting it to the surface, what isn’t captured immediately is encapsulated and released from your carpets fibers to be vacuumed away on your next cleaning. We then follow up with state-of-the-art equipment using our unique process to pull the dirt and water from your carpet, leaving behind a truly deep-down clean. Steam cleaning and other carpet cleaners that use soapy water and chemicals often leave behind a sticky residue that can attract dirt, resulting in your carpets getting dirty again faster and requiring more frequent professional cleanings. Since it doesn’t contain any soaps, detergents or harsh chemicals, ProDry’s core cleaner, ENCAP-Extra, does not attract dirt so your carpets stay cleaner longer. At ProDry we only use green-certified carpet cleaning products, including our primary cleaning solution ENCAP-Extra, Because of this we provide you and your family a healthier cleaning in two ways. First, our products are safe for your entire family and pets and second, the use of less water helps combat mold and mildew growth in and under your carpet. Unlike our process, typical steam cleaning not only utilizes harsh soaps and chemicals to clean your carpets, but uses a heavy amount of water that often soaks through to the carpet backing, creating a breeding ground for mold, mildew and bacteria. 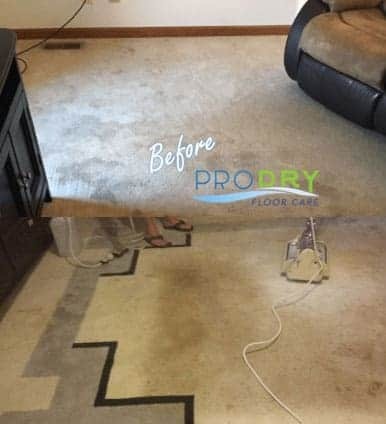 ProDry uses an encapsulation process that will leave your carpets and upholstery cleaner and helps promote a healthier home for you and your family. Thanks to our low-moisture, encapsulating extraction system, we can offer you a deeper, healthier carpet and upholstery cleaning that you can feel confident is safe for your kids and pets. ProDry has been dedicated to helping families live more healthfully … because a clean home is a happy, healthy home. 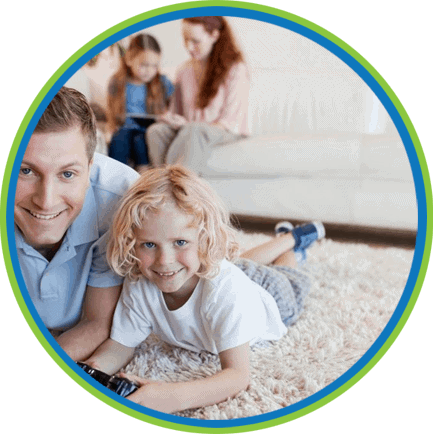 Choose ProDry for a healthier carpet and upholstery cleaning and a safer, refreshed home that the whole family can enjoy.